So, Thursday morning, 4.45 a.m. The radio alarm’s gone off, I’ve woken up to the gentle strains of classical music on Radio 3, said “Bleugh” to no one in particular, rolled over and gone back to sleep, and then 3 minutes later had the shock of a second alarm exploding in my ear (you’ll notice I’ve done this before), over and over like a robot trying to work out why a clown horn is funny. This was the day of the big interview in Stornoway on the Outer Hebrides. All week I’d been carefully mugging up on the geography of the archipelago, trying to work out how to pronounce the Gaelic names, researching the demographics and the islands’ history from the Vikings up to the clearances and famines of the C19 and on to the present day, and thinking up ways I could make my resignation from the SCA sound like a grown-up and mature course of action (tough call). An hour later I was dressed in my best interview suit (i.e., only three people stopped me to ask if I was selling The Big Issue) and strolling up Waverley Bridge to catch the shuttle bus to the airport. I was a little surprised to see a small crowd gathered at the stop before an empty bus, and a man in a fluorescent jacket talking to everyone. All of Scotland’s airports, he told us, were closed – something to do with volcanic ash from Iceland, apparently. No planes were taking off or landing. The buses were running every 10 minutes as usual – we were free to take one if we wished – but we weren’t going to fly anywhere that morning. Huh. So that was that. I returned to the flat by dawn’s early light and through the rest of the day watched my amusing little story become headline news, as the cloud drifted south and gradually shut down English, Welsh, and then Continental airports too, so that 5 days later Europe is still pretty much a no-fly zone. At the time of writing no one knows how long this will last, or what the consequences will be. Not bad, as anticlimaxes go. Mind you, sometimes I imagine how I would have felt if I had made it to the interview, not got the job, and then been stuck in Stornoway for 4 days (Stornoway’s the main town on the archipelago, population 6,000 or so…). Anyway, once the travel situation (or at least the sky) is clearer, the interviews will be rescheduled. 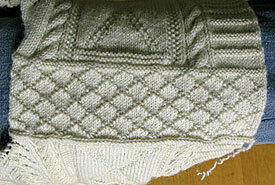 Meanwhile, you’ll see from the photos that I’ve finished the shoulders (using the same diamond trellis pattern from the yoke) and joined the shoulders at the back. 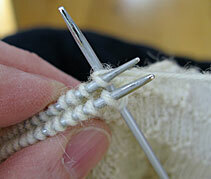 I plan to develop a “how to knit a gansey” section for beginners as part of the website, so we’ve made a start by taking some pictures of the technique for joining the shoulders. 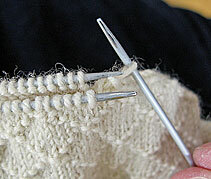 It’ll be old news to most of you experienced knitters out there – in fact most of you will probably tell me I’m doing it wrong! But it may even extend one day to YouTube style video demonstrations, who knows? 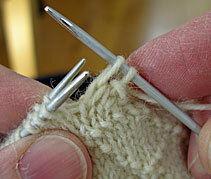 you will now have a new stitch on the third needle. 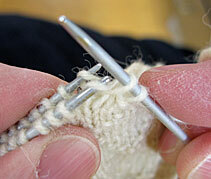 Repeat for the second pair of stitches, so you now have 2 new stitches on your third needle. 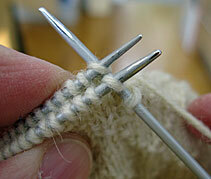 Slip the first stitch you made right over the second. 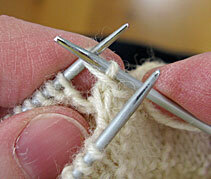 You now have one stitch on your needle (the newest one). 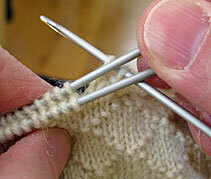 Repeat the process until all your shoulder stitches have been knit through and cast off. 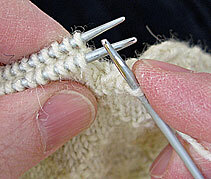 When all your shoulder stitches have been cast off and you only have one stitch left, on your third needle, thread the tail of your yarn through the loop of the stitch and pull it tight. Like a serpent eating its own tail, you’ve made a tight knot that can’t unravel – and you’re done. And the best bit? No sewing involved at any stage! It looks GREAT, Gordon, and thanks for the tutorial. I have grafted the shoulder seam on the two ganseys I’ve done, but it’s so easy to lose the rhythm and stitch through the wrong way. I knew your knitted join was an option when I did the gansey during the winter, but it’s great to see the step-by-step lesson, and in retrospect, the knitted join would have looked better with my ridge and furrow shoulder. Do you allow 2″ ease in your chest measurement? or more? 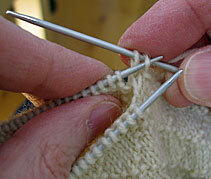 Great pictures of three needle bindoff. I’ve looked for tips on doing arm gussets, in vain, and eagerly await your instructions. Well, I hope to make the tutorial a feature in future, as I say, but given my glacial progress on knitting the dam’ things it’ll probably be this time next year before I’ve covered enough aspects of ganseys to be remotely comprehensive! Yes, Gordon, the “ease” I meant was the extra in addition to the chest measurement (and,yeah,YOUR chest may be the same as YOUR body, but on my next one, I plan to add more “ease” for my excess body parts.) This project of yours has certainly inspired me to do another gansey. ’twas nice of them to have someone at the bus letting people know what was happening. Very civilized. This whole situation with the airport shutdowns and the ash is quite interesting. I gather from Icelandic vulcanologists that this could go on for rather a long time. 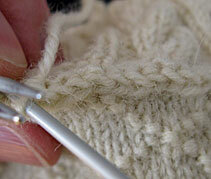 Nice step-by-step photos of the bind-off! Gail: while you await Gordon’s words of wisdom on the matter of gussets, you might look at Beth Brown Reinsel’s book on Knitting Ganseys. 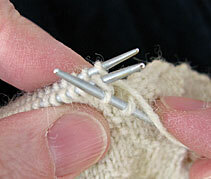 She gives some valuable tips about proportioning the gusset to both the gauge and the size of the gansey. It is a very useful book to have in one’s gansey reference library because Beth gives you the tools to build a gansey with whatever motifs tickle your fancy, in whatever smooth wool you have on hand. If you cannot find the book easily, I can probably paraphrase the nuts and bolts for you. 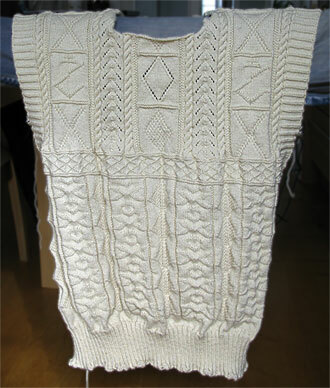 When knitting ganseys for persons of the female persuasion, I tend to knit the “tube” of the whole body to the dimensions of the widest part of the chest, relying on (a) the ribbing of the welt to draw it in around the waist, and (b) the gussets to allow for a bit of easing, and when faced with a (*cough*) largish chest, I tend to make the gussets longer and wider for extra comfort. Yes, I thought it was very civilised of the bus company to let us know at the bus stop – though there is just the one main stop in the city centre from which all the airport buses depart, so at least they only had one place to cover. It was weird seeing the fleet of illuminated empty ghost buses gliding through the pre-dawn city centre, like a Dr Who episode where the familiar becomes strange and disturbing. The ash is still pouring out, though it seems to come and go. The real problem is that the UK is under high pressure with north-easterly winds (I think), which isn’t usual for this time of year – certainly it’s unusual for these conditions to hang around so long – so the ash is being blown over UK airspace, instead of dissipating in the direction of the north pole. It’s supposed to change by the weekend, hopefully. 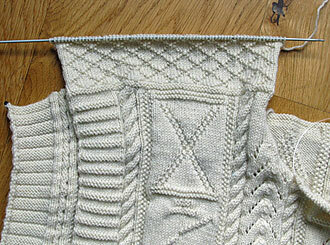 Great advice regarding the gusset and I shall definitely revise there on the next project. Call it a dry run, I guess. Stornoway’s not a bad place but the expense of a rental could have been unfortunate as you’re not a tourist, especially since you probably didn’t have your knitting with you. There’s a BBC programme on tonight about a naturalist who spent some time on one of the islands, one of the Uists, so I’ll get to see a bit more.